Star Wars Episode VIII has been written, though that hasn't been Abram's biggest challenge. Can't wait for more Star Wars? Neither can J.J. Abrams. While the movie franchise's latest helmsman is excited for the seventh installment of the series to drop this winter, Abrams has revealed that its sequel has already been penned. "The script for [Episode VIII] is written," Abrams revealed in an interview with Wired. The film will be directed by Rian Johnson, with Abrams on board as an executive producer. "Rian has asked for a couple of things here and there that he needs for his story," added Abrams regarding the joint effort to tie Episode VII into VIII. "He is an incredibly accomplished filmmaker and an incredibly strong writer." While a script has been created for Star Wars: The Force Awakens' successor, by no means has the future for the galaxy far, far away been cemented. "I'm sure rewrites are going to be endless, like they always are," said Abrams. 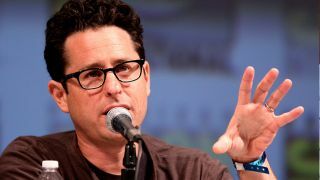 Known for his penchant for mystery in his films, such as Super 8 and Star Trek: Into Darkness, Abrams has been intentionally light on details for the series' direction. Details have been sparse as The Force Awakens quickly approaches its release date, which only compounds the secrecy around the plot of the sequel. Abrams has worked with Disney to keep the trilogy's plot a secret. "[Disney wants] this thing to be an experience for people when they go to see the film, and I'm grateful for that," the movie maker says. The suspicious absence of Mark Hamill appearing in trailers as Luke Skywalker has also led to a hotbed of internet rumors regarding his role in the films. Whatever Abrams and Johnson have up their sleeves, we can only hope the surprisingly sound fan theory that CG abomination Jar Jar Binks might have been a Sith Lord remains in realm of speculation. In the same Wired interview, Abrams also shared his concerns and excitement working behind the wheel of the legendary sci-fi fantasy franchise. "Every detail, whether it was the design of a costume or the music or a set-dressing choice, must be embraced as coming from Star Wars," said Abrams. "You're inheriting Star Wars! That's not something you can do lightly." When asked to discuss his biggest challenge in making the movies, however, Abrams revealed that it was finding a cast to stick around for three films. "We knew we weren't just casting one movie...we were casting at least three." For fans of the adorable Sphero BB-8 droid making the rounds of the internet and offices everywhere, Abrams also shared his experience introducing the robot in a scene with Anthony Daniels, who reprises his role as the classy and classic golden droid, C-3P0, in The Force Awakens. "Yes, BB-8 is a great character," said Abrams. "But what will happen when he's suddenly in a scene with C-3P0 or R2-D2? Will it feel bizarre? Will it feel wrong?" When Daniels expressed his love of the character, Abram admitted, "We're going to be OK. Because if he's OK, it's working."